My mother died this morning at 7:42 a.m. She died at Renaissance Gardens, a nursing home at Riderwood, a retirement community in Silver Spring, Maryland. 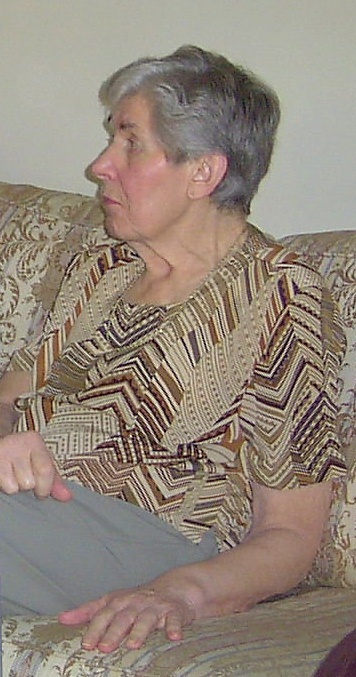 While she died peacefully, her condition (Progressive Supranuclear Palsy) made her last few months quite unpleasant. While we are of course grieved to have her gone from this life, we are also relieved that she is no longer in pain or distress. She was born in the midst of the Great Depression in Bay City, Michigan. Her parents, poor Polish immigrants, somehow raised twelve children while eking out a living that kept the family in poverty for most of her childhood. Since she grew up in adversity, she knew adversity. It shaped her entire outlook on life. Despite being in a desperately poor family, she was able to latch on to the American Dream somehow. Partially because there was a war on, and partially because her older sister Essie and her husband found the money, she went to nursing school in Washington, D.C. There at Catholic University she met a tall, blond and skinny man six years her junior named Jim. While she never expected to be married, Jim was persuasive. They were married on June 21st, 1950 in Bay City, Michigan. Over the course of their 55-year marriage, they raised eight children. I am one of them. An engineer’s salary greatly exceeded her father’s salary as a butcher, but my siblings and I still lived a fairly Spartan and no-frills existence. Somehow, Mom and Dad raised eight of us. We absorbed their work and education ethics. Among my eight siblings, three have PhDs and three others (including myself) have graduate degrees. My marriage of twenty years is in the middle of the pack. My sister Doris celebrated thirty years of marriage this summer. My parents can also count nine grandchildren to their credit. She filled our tummies with delicious and healthy foods that had most of us salivating for more. She expressed her passion mostly in her cooking. Many dishes, such as spaghetti sauce, she made from scratch. Her pressure cooker steaming away and the percolator filling the house with aromas of Maxwell House are memories none of us could possibly forget. The yellow cakes with chocolate frosting that she made for my father seemed as numerous as stars in the sky. Whether cooking, cleaning or just fussing she was always in motion. She expressed her love through action. Yet she discounted her own abilities. Despite having earned a B.S. degree in nursing, working as a teacher for a number of years, operating as scrub and psychiatric nurses, she considered herself stupid. She idolized my father’s intellect and generally allowed him to make the important decisions. She grew up steeped in the mysticism of Catholicism. My father also felt similar devotional inclinations. Our childhood years were full of devout and some might argue dysfunctional Catholicism. Daily rosaries, weekly masses and periodic trips to the confessional were an accepted part of growing up, as were parochial schools, when they could afford it. Every morning before they started the day they prayed together at the side of their bed. We knew our mortal from our venial sins. We were always looking over our shoulders wondering if God was frowning at us for our latest minor transgressions. After her children had flown the coup, my mother was a bit lost. She never returned to work so instead invested more energy being the good submissive wife who catered to my father. Too much togetherness between them was probably not healthy. However, they had their values and there was no changing them. Marriage meant forever because God himself had joined them. Both played their marriage script, often sniping at each other in a tired passive-aggressive fashion, to the bitter end. As my mother declined, their roles reversed, much to my mother’s horror. All she knew how to do was to give. It was infuriating to her not to be able to give, but to have others take care of her. Every little decline added to her unhappy state. My father floundered a bit in his new caretaker role. My family stepped in to support him. Our family (principally my sister Mary) saw the obvious. When it was clear they could not manage a house together anymore, we worked through the logistics of moving them from Michigan to Maryland. It was family in the end that I think brought home to my mother the realization that she was indeed not just loved, but cherished. For my sister Mary and me, who live locally, caring for her meant a lot of grunt work. For me it was weekly visits. Mary did the same but supplemented it with so much more. Every day was a challenge for her to make my mother’s declining life have some meaning. Others visited when they could, which was surprisingly often, considering it meant plane rides. The end of my mother’s life is really but a footnote to a long life that spanned 85 years and 8 months exactly. My mother’s life was about service to family. To her husband and children it was about doing things to place us in a safe and stable family environment. Nevertheless, she also had something of a previous life. She was not married until the ripe age of 30. Before marriage, she was a good but unnoticed woman who won affection by being at her parent’s beck and call. Her acts were quite extraordinary. For example, she cared for her severely mentally ill mother while nursing her colicky first child, my sister Lee Ann. This meant years of constant interruption and almost no sleep. No grunt soldier slogging through the Rhineland worked harder. Now she is at rest. We know what her life was about, but I sometimes wonder why she went to such extraordinarily lengths for us. For now we do not analyze, we simply mourn her absence. Millions of us die every year, yet each of us has powerful individual life stories. Her life story too is very powerful. Yet to me at least she remains something of an enigma. I feel that whatever she is supposed to do, her journey is not over. I think she has other lives ahead in other bodies. This life was a lesson for her. If she is granted another one, I hope it is one where she will have some time for reflection and ease. I hope it is one where she no longer basks in someone else’s life, but is one where she becomes the person she was meant to be. That is my hope for her. It is my hope that death for her is not the end. Rather, I hope she is a chrysalis and through her death she is transformed into the beautiful butterfly so hard for any but her family to see. It is this hope that gives me comfort while, understandably, I am feeling for a while adrift without my moorings. Those who feel so inclined may name a donation on her behalf to The Society for Progressive Supranuclear Palsy. A lovely tribute to your mom, Mark. May she rest in peace. A fitting eulogy Mark, and a fine tribute to your mother. Perhaps readers like myself can learn from her story (which you’ve kindly shared) and work as hard as she did to bind together our families. Your mother was a remarkable woman. Take your strength from that over the coming weeks and months.